IR Clock Radio Hidden Camera & DVR Video Recorder All in One. 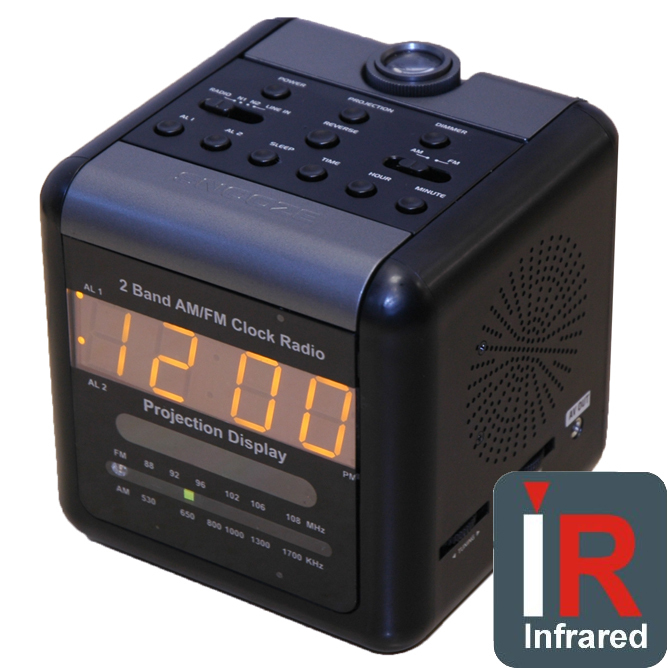 Our new Night Owl IR Clock radio camera allows you to see in the dark! The hidden infrared IR night-vision alarm clock camera with microphone and built-in DVR is a great choice for homeowners who want to watch their children, nanny, home healthcare worker or more without anyone ever knowing they are being recorded. This new version of our best-selling ALC-DVR32 now has a high resolution 480 TVL Sony CCD image sensor and invisible Infrared IR nightvision to see even when it is pitch black. For the business owner, this alarm clock camera can fit right into your office, as it is a fully functional alarm clock radio, so your employees will never know that you are recording everything that happens in your office. This hidden camera has a built in DVR so you simply plug the alarm clock into the wall and plug in an SD card (4GB sd card included supports cards up to 32GB) and this alarm clock will record audio and video covertly. Unlike many alarm clock DVRs on the market, this alarm clock spy camera has the SD card slot totally hidden in the inside of the alarm clock battery compartment, so that no one will even know that it is a DVR. Packed with additional features, this ALC-DVR32NV alarm clock hidden nightvision spy camera provides high quality real-time video and audio recording with time/date stamp and motion detection recording. This camera and DVR includes a video/audio cable that can be plugged directly into a TV to playback the video and audio onto your TV. Or remove the included 4GB SD Card and plug it directly into your PC to playback video and audio on your PC. This DVR records continuously or on motion detection (default), and like our more expensive DVRs: once the SD Card fills up, the DVR automatically begins to over-write the oldest video. This way you can always keep a rolling storage of what happens in your home or office. The Alarm clock, projector and radio are all fully functional, so no one would ever know that you are really recording them with this hidden covert DVR camera.